Our optimism is backed by data. 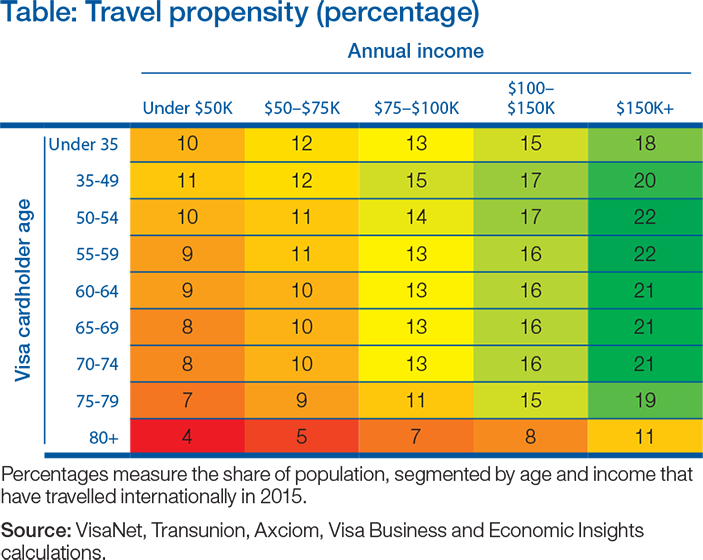 We estimate that travel spending will reach an average of $5,305 a year per traveller by 20251—and that does not include costs spent before a trip, such as for an airline ticket. We are seeing a rising “traveller class” that will spend a growing portion of its household income on cross-border travel. Tomorrow’s travelling class will likely be much older and hail from the emerging markets—very different from today’s typical international traveller. 1 Visa, Mapping the Future of Global Travel and Tourism, 2016, https://usa.visa.com/partner-with-us/visa-performance-solutions/global-travel-and-tourism-insights.html. 2 Oxford Economics, Global Economic Database, April 2016. 3 Visa Business and Economic Insights, 2016.